Since the first surgical procedure of this type in 1997, single incision surgery for biliary tract disease has been slow to gain popularity. Recent descriptions of SILSTM and SPATM have shown great potential to revolutionize minimally invasive procedures. The average general surgeon still has to face a significant learning curve and to decide how to introduce such novel techniques into a busy private practice. A consecutive series of patients were brought to the operating in the hopes of performing single incision cholecystectomies. Pathology, time of surgery, BMI, and post-operative course were analyzed for all patients. From August to October 2007, ten patients had attempted single incision surgery. Four successful SPA procedures and two successful SILS procedures were performed. There were four conversions to two port cholecystectomies. Operative time ranged from 30 minutes to 2 hours. Four procedures were for biliary dyskinesia and the remainder for calculous cholecystitis. There were no biliary leaks or biliary duct injuries. There were no complications at the umbilical site of entry. 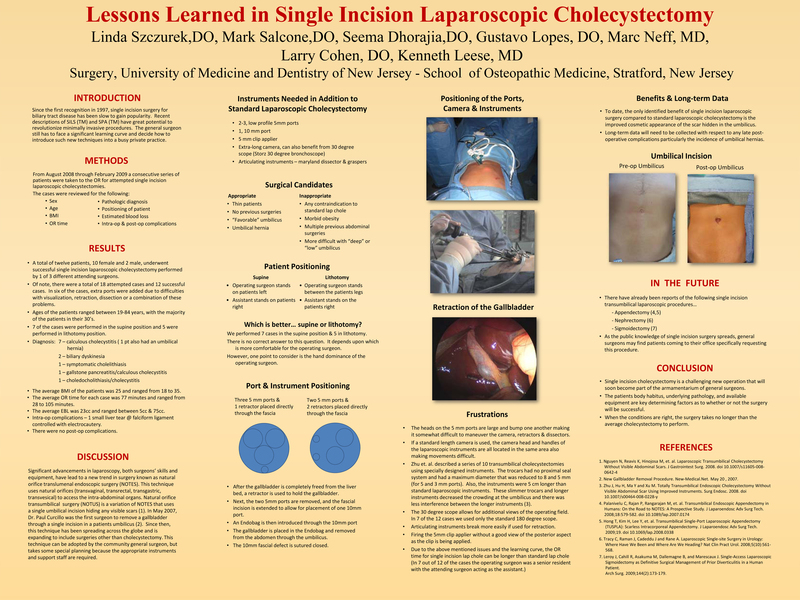 Single incision cholecystectomy is a challenging new operation that will soon become part of the armamentarium of general surgeons. The patient habitus, underlying pathology, and available equipment are key determining factors as to whether or not the surgery will be successful. When the conditions are right, the surgery takes no longer than the average cholecystectomy to perform.